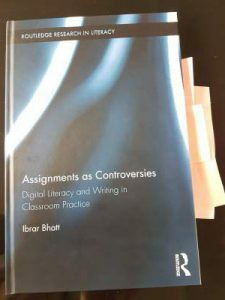 Ibrar Bhatt’s book ‘Assignments as Controversies: Digital Literacy and Writing in Classroom Practice’ explores the practices of learners in college classrooms. This monograph is a development of Ibrar Bhatt’s PhD research, published in the Routledge Research in Literacy Series. Prior to reading the book, I wondered about its audience and potential usefulness for classroom practitioners but reading it has revealed a well-designed structure and engaging writing style that renders it useful to a variety of audiences and purposes. The first part, ‘Literacy, Technology and Society’, lays out the concepts for the ideas developed in the book, and Actor Network Theory that guides the research. The review is written in such a way that it is not only essential for researchers in digital literacies, but also very useful for practitioners writing assignments or planning lessons in digital environments. The focus on practice and the relationships between human and non-human actors makes a refreshing change from some of the approaches to digital literacy offered to teachers and learners. In Part II there are three cases of the practices of students doing assignments: Sara’s Assignment on Childcare, Anne’s Digital Portfolio, and Paolo’s Report on Social Media. Between them, the cases achieve breadth and depth of the topic. The research method has a firm focus on the practices of the learner, with close personal observation by the researcher, supplemented by video footage that is subject to later annotation using the ELAN software, and related data such as college policies and details of the technology offered in the classroom and brought by the students. In Sara’s case, ELAN annotation was used to explore the interruptions to her work by the Google algorithm. This deep and rich approach to exploring learner practices in digital environments reveals not only learners actions, but also shed some light on the broader set of actors such as the teacher, algorithms, acceptable use and other college policies, the assignment brief, the Moodle VLE, previous assignments written by the student, and relations between these actors. The choice of learners for the case also managed to deliver breadth of learner practices to the research. Sara’s brief required her to contextualise the assignment in her workplace, as well as use educational resources. 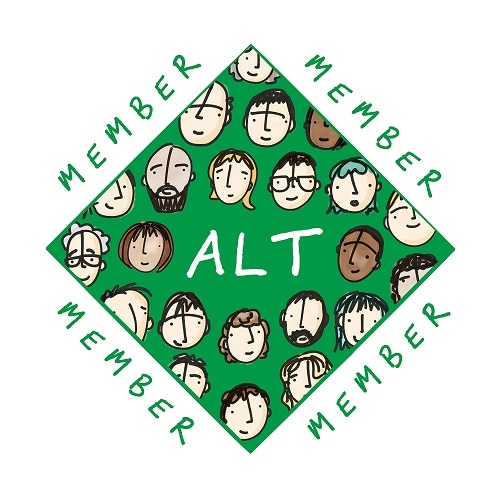 Anne is a college teacher taking the Technology for Learning and Delivery course, who is producing a digital portfolio created on different technology platforms. Paolo, a Portuguese student who is studying English as a Speaker of Other Languages (ESOL) does a social media report. Ibrar Bhatt used an innovative method of facilitating learners’ construction of Venn Diagrams to map their digital literacy practices across Home, Work and College contexts. Each case is interspersed with vignettes of learner practice into a narrative that builds the emergent concepts: the ‘nested dolls’ effect of assembling assignments, curation as a digital literacy practice, and irruption (rather than disruption). Curation may be the pre-curation that happens in lesson plans, handouts and assignments and also the curation done by algorithms and by learner themselves. Irruption focuses on the actual displacing practices in digital contexts rather than the technology that might be involved in disruption. These concepts are explored in detail in Part III of the book. It is in Part III of the book that the concepts that emerge from the research, though based on the localised contexts of the three cases, become available to inform other contexts. In reading them I saw parallels in Higher Education and informal education. Sara, Anne and Paolo’s stories reveal how they work around the constraints imposed (often with good intent) by college policies, instructions on how to use technology, and sometimes by the technology itself. 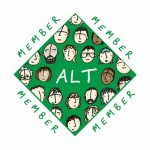 When we know more about learners’ literacy skills in other contexts, we are in a better position to support their development (rather than suppression) of critical thinking. We can also learn how to write ‘better’ assignments. Great article!!! Thank you very much for sharing this detailed review..It was very helpful and I really enjoyed reading it.